Crude bathrooms and robust bathrooms. For Regino da Cruz, today there are two completely different approaches but at a juncture where the cost of construction “is excessive”, design and comfort are factors that “bring the product in line with cost realities”, in a space that is, more than anything else, functional. The biggest concern of this Architect from Estoril “pointless innovation”, guaranteeing that everything that reaches the market with the mark of REGINO CRUZ - Architects and Consultants, will stand the test of time, from the aesthetic point of view. Bathrooms today are as important as any other part of the home, combining functionality with well-being. How do you view the evolution of architecture in these spaces? I feel that spaces with these characteristics have acquired undeniable importance, in terms of construction costs, if we analyse the reality of the last twenty years. I would say that in a dwelling, whether a house or an apartment, we can easily identify three types of spaces: the kitchen, which is without doubt the most expensive per square metre, the bathrooms, which follow, and other sections, which are those which have less weight, although they have more square metres. If we analyse the evolution of the bathroom in our civilisation, we can observe that, in the last fifty years, it now has a presence in our day to day life that it didn’t have earlier, and in these past twenty years, that presence has grown even more significantly. It must be said that in human history, the so-called western world (or European world) has historically given less importance to hygiene through the centuries. Historically, the American Indians were extraordinarily clean, as well as the eastern world. But the cleanliness of the “uncultured” or “barbarian” Europeans left a lot to be desired during the last one thousand five hundred years, which is something that can be seen in history books. In the transition from the 19th century to the 20th, and specifically with European societies, where common folk begin to enjoy certain rights (the first of which is the right to survival), it can be seen that hygiene is a basic need, with economic benefits as well. This turning point aimed precisely at defending the right to life, avoiding deaths from communicable diseases, which can be prevented with hygienic measures. The logical conclusion is that, with respect to daily family life, hygiene in the environment where families spend leisure time together and spend the night is fundamental. In the last century, there has been a marked increase in the importance given to spaces where hygiene is a necessity, namely in kitchens and bathrooms. Analysing this short journey through the decades, now with a focus on Portugal, we can conclude that in the first half of the 20th century itself, the bathroom is still an element that is at the most an accessory, and exclusively functional at that. At this point, this space merely serves a hygienic function, without anyone considering it from the perspective of well-being. However, with the growing importance given to architecture by modernism and, very specifically, with the increase in design sensibilities in the sixties and seventies - visible, for example, in the characterisation of certain designs by renowned foreign designers - the bathroom begins to take on significant importance within our day-to-day environments, something that could only be dreamt of in previous decades. In light of this evolution, what is most valued: Functionality or aesthetics and well-being? That depends on how much one is willing to pay, as always. I feel that there are not two types of completely different approaches: the crude bathroom and the robust, evolving bathroom. At the moment, we are in a phase where the cost of infrastructure begins to be attractive. On the other hand, there is less money in the world and construction costs are excessive. In this or any other context, hygiene is absolutely essential, something that is today taken for granted in evolutionary terms, when compared to the entire historical background I mentioned earlier. The characteristics of a functional environment in the bathroom are something that people no longer put aside. Unless we go through yet another dark ages, as some apocalyptic prophets claim - although I do not share this fear - before anything else, the bathroom needs to respond to basic needs. But today, there is preference for other elements, such as natural light, design or comfort. Which elements are essential for these spaces? Well, design and comfort are factors that, in a very pragmatic way, need to be in line with the cost realities of the product to be used. We have an apt example in the automotive market: if there were only BMWs or Bentleys, I feel that the number of cars that would be sold would be far lesser than what we have today. But the fact is, there are products aimed at each segment, based on needs. And would this process be the same in our bathrooms? My answer is yes. At present, it is very important for us to understand that, first, these have to respond perfectly in functional terms; second, matters dealing with comfort can be dealt with only after resolving the questions of functionality, and these demands vary based on the financial resources available. In this context, I feel that the market for sanitary ware, in which Sanitana operates, needs to know how to adapt to present demands. Finally, it is important to emphasise that through the last two decades, the design factor has come to be extraordinarily demanding. Today, even the most economical products have to be pleasing to the consumer’s eye. It is precisely within this framework that, according to me, a large brand like Sanitana begins to evolve, as demonstrated by the high-end products on offer, together with a more economical range, where design continues to be a concern. Is there demand for increasingly sophisticated elements, including sanitary fittings? Not only is there demand, as there always has to be an alternative. It is evident that while it is necessary to have a supply for a large volume of houses, for the middle class, it is also necessary to supply the limited volume of houses of the upper classes. Which sanitary fitting is given the most importance by your clients? They give equal importance to all, without a doubt. There can be no doubt that fittings where the least importance is given to production and design, will be those that clients value the least. It is a basic rule, that a chain is only as strong as its weakest link. Additionally, we cannot afford to ignore any aspect: whether we are dealing with one washbasin, a set of washbasins, the commode, the bidet, the shower boxes, bathtubs or the Jacuzzi, all these fittings need to be extraordinarily well developed in technical terms, comfort and design. Any fitting that is out of place will be the one that stands out. 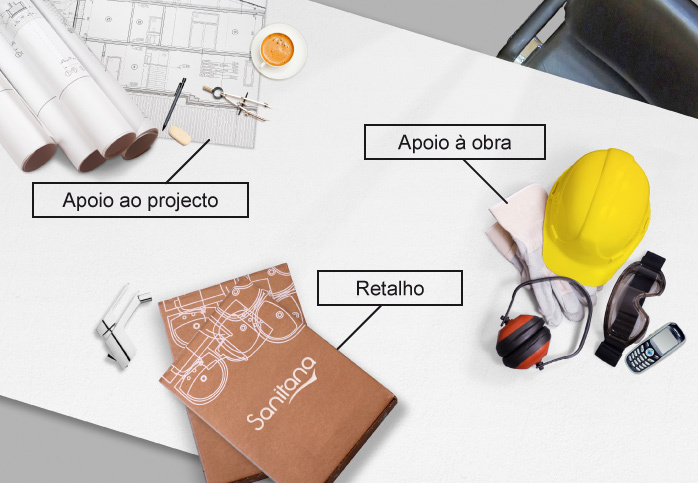 In your projects, do you choose specific brands of sanitary fittings or do you look for a certain type for each project? In a manner that is coherent with what I mentioned earlier, we have to start from two essential factors: we either want a crude bathroom or a robust one. Essentially, in the first case, we simply manage square metres, of a closed space that is simply functional. As is natural, we choose relatively small fittings that are easy to use, but as we are often dealing with centimetres, this ease of use has to be perfectly adapted to the market, in terms of price. I’m obviously talking about the purchase of a high quantity of fittings, for example for a group of a hundred apartments or for a convention centre with a hundred sanitary ware cubicles; we are therefore dealing with a highly repetitive margin, with large quantities. In a robust bathroom – which is nowadays often integrated into a large room or a quality hotel, the price factor becomes secondary to design, where the final set needs to consider at far greater length, in a manner that is fitting. Everything is more personalised. As a final observation, I must mention that in these robust spaces, there is a difference in the product that we, as architects, design. In a hotel, where there is some repetition, a depersonalisation of our capacity to specify the product for the final user, I can say: I like this product a lot, let us fit this washbasin or that bathtub. Whereas in a robust bathroom installed in dwelling, such as a mansion, the final consumer is king, as a result of which, although I really like a fitting, I must respect his or her choice. And in this process, what is the role of the builder? Is it true that they feel that they should have a say in architectural matters, for example in the choice of sanitary fittings? Yes, of course, and in the ideal situation, this is normal and healthy. The Portuguese love to give their opinions, whether or not they know what they are talking about. I greatly prefer that they tell me what they are thinking rather than giving me an opinion (just because I’m an architect), thereby placing themselves in a position that does not correspond to them. From a purely objective point of view, any opinion has, from the start, a fifty per cent chance of being right or wrong. Builders are professionals who are in the market, which can enable them to give important inputs, which often happens. Architects are not, nor can they be, owners of the truth. We are merely cogs in a wheel that has a single goal: to transform a dream, a certain, highly ethereal concept that is in its starting stages, into something real that exists to be used by humans. That is the architect’s duty, to be a cog in the wheel. If the inputs from the builder in an open discussion are valid, so much the better for him or her. What are your materials of choice in bathrooms? That’s a very interesting question, in the sense that, in terms of framework, we are obliged to do something that may sound trite these days, which is to innovate. In any discussion these days, we hear the word "innovation" at least five times; it is a tired play of words, where its exaggerated use is ridiculous. Taking on this caricature, I feel that it is interesting to think that my main concern is to avoid pointless innovation, that is, to guarantee that everything that comes out of this office with our signature survives, from the aesthetic point of view, for a long time. Secondly, but just as important, the future maintenance of a project must be easy for those who have to pay for it. Until now, no project with the REGINO CRUZ signature has used materials with a short life span, with the worry that this would be big news. I don’t find this fair. Nowadays, there are many materials that are undeniably interesting, but which have not been around for long enough to guarantee that they can survive the relatively intense wear that bathrooms are subject to, with certain detergents, for example. It would be like, for instance in the production of Port Wine, adopting PVC stoppers, which are much cheaper, to the detriment of those made of cork, without properly testing their durability. The question that arises is knowing how long the new material preserves the product in the same condition. At the level of materials for bathrooms, there is no doubt that, in terms of abrasion and corrosion, detergents and cleaning surfaces (scrub pads, etc.) used in the daily maintenance of these spaces have the destabilising capacity that, over decades, can cause problems. Another of our concerns at our company is that our architectural projects should not go out of style, as happens easily with bathrooms with walls painted pink or yellow. These colours are ideal for brands such as Sanitana, as clients easily tire of these kinds of colours and end up wanting new bathrooms! At REGINO CRUZ, we prefer a more serene and permanent position, which stands the test of time. In terms of base materials, what styles do you prefer (minimalist, purist, futurist) and how do you deal with the mixing of trends? Our position has always been that of some, although not extreme, minimalism. To the extent possible, we include in our environments a dash of colour, to show that we are alive, but without great pretensions in terms of creating atmospheres that are too intense. In this process, there is some space for mixing of trends, but essentially with elements that are easy to replace (as a device for introducing some sparkle, it is enough to throw in some red towels or soaps) or, in terms of unique design, to install extraordinarily personal fittings, such as the washbasin, commode and bathtub in red, if this is what the client wants. In our day-to-day work, we are more sober. Do you feel that the main brands in today’s national market are in line with the new consumer trends, such as having a mini-spa in the bathroom? I think yes, maybe even too much so. Today, there is an extraordinary variety of products and, especially with reference to consumers, we have no doubt that they are completely unprepared, that is, they only use a part of the available functions, as tends to happen with mobile phones. If the client is aware of even half of the options for a bathtub with a fabulous Jacuzzi, that in itself is extraordinary. We are in a consumer society where the supply is far greater than what we can consume. Have you received requests to transform bathrooms almost into shared spaces, for example, with two shower options? Yes, but from a very small fringe, and I’ll explain why: based on a very interesting analysis of a sociological nature, it is observed that for the past fifteen years, our personal income has been declining, even after having gone through, in the nineties and the year 2000, the yuppie years, represented by a very young class that earned a lot of money. From the turn of the millennium, even abroad, the financial debt situation of people between the ages of thirty and fifty started to be more constrained. This is a curious matter, to the extent that it presents to us the differences in mentality between young adults and older people. It cannot be denied that, to the extent that we leave our youth and enter into the compulsory maturing that is part of old age, our taboos are much more established. The way that someone only thirty years old uses a robust bathroom, extraordinarily open, for example, taking a shower in the room while his partner is in bed watching television, is very different from the way someone aged seventy would use it. At this age, tastes are more modest and people might not feel comfortable in such circumstances. In the course of our activities, we have already faced this problem at some point... consider this case: in some cases we support bathtubs incorporated into the living room and the hotel room, not closed; but we’ve also had to create aesthetic alternatives that allow for optional enclosures, giving us that privacy, whenever required. Therefore, our creativity needs to adapt a lot to users, and the possibility of that generation of young middle class people with money being bold at this moment is very low. The financial aspect plays a significant role and spaces with two shower options, as mentioned earlier, entail an increase in square metres, which in order to be managed in terms of final construction costs requires the presence of an open space. It’s the only alternative and that’s what we have done. At this moment, we are working on some projects where the client, in order to have more space in the bathroom, dispenses with the Jacuzzi, or exchanges a shower for a tropical platform where this is a tunnel made up of a transparent chamber one and a half by four metres, in glass. The shower area almost becomes a compartment where exterior visibility and ample space are essential. These options depend on a negotiation with the available square meters, precisely adjusted due to the framing of the final cost of the cabin. Do you feel that devices used in bathrooms comply with growing environmental concerns through the use of energy and water saving technologies? With regard to sanitary fittings, I feel that the manufacturing process and the materials used have evolved, in terms of sustainability, as have environmental and ergonomic concerns. Catalogues are certified at the level of sustainability criteria, but in addition there has to be constant research at several levels. Do you feel that the crash in construction due to the downturn in the market has led to a trend of remodelling existing spaces? Well, the projects we are working on are new constructions, there aren’t many geared towards remodelling, at least at this point. However, my instincts tell me that the trend for modifying spaces has to take place and is taking place. These days there isn’t, as there was ten years ago, a lot of money for new purchases. Also, clients’ moving needs, whether due to reasons of well-being, business commitments or because their house or hotel needs a face lift, find an alternative response in the remodelling of spaces. On modifying them, we try to rejuvenate them naturally, in terms of style and the materials used, giving them a new look. This is one area where we will be entering into the future, also because I feel that this market is headed for more development. Of the projects you have already designed, which bathroom would you say was a professional challenge or achievement? This is something I refuse to do, because it would be extremely unfair on my clients, leading them to misjudge the effort we put into each project. What I feel is most important, as mentioned earlier, is having the talent and humility necessary to precisely adapt our creativity to the needs of the product that is required of us. And this is true of crude as well as robust bathrooms. In some cases, the first option would be the best, particularly in an area of four square metres. What really matters is the capacity of the architects, naturally supported by that value chain I mentioned earlier, for executing the project exactly to measure. That is the biggest challenge in transforming the client’s dream into reality. It is necessary to adjust costs to an aesthetic framed within needs and that, in time, works well, and continues to please people. In the seventies, we had several examples of the great frustration involved in passion that is not transformed into love. For instance: I love a certain design, in a way that I identify with it, I love it, it has a sense of human ownership, and I carry it out; but with the passage of time, I begin to find it outdated. So the passion is not transformed into love, and I later need money to destroy and build it again. By then I have to live from day to day with that presence imposed on me by my old passion, but which now bores me. So, it’s exactly to avoid what I just described that we try to develop our activity. How do you see the bathroom of the future? Using the classification of the crude bathroom and the robust bathroom, I would say that, for both types, there are two components: technique and aesthetics. Technique is ever more evident in our daily experience, at the level that it works behind the fittings, with the ability of recovering grey water from a bathroom, the possibility of making artificial lighting efficient (using less energy with longer lasting lamps) or the capacity of organising ventilation with energy savings. All of these concerns are related to effectiveness through time, in crude as well as robust bathroom. Simultaneously, the question of aesthetics has to face up to construction costs. This is something that is easily undertaken as having added value, in the sense that it raises the possibility of providing that space with natural lighting and ventilation, for example. Logically, if it were necessary to choose natural light in only some parts of the house, the bathroom would not be one of them, being located in the side-lines of the volume available for that architectural project. The aesthetic part has a close relationship with the often mentioned square metres for construction available to the architect in the sanitary environment.